These are the words that I came to live by after a sports injury in high school. It was during this time that many doctors tried convincing me that harsh pain killers and invasive surgical procedures were the answer to the pain that I was experiencing. However, it wasn’t until the day I found my chiropractor that my life had changed forever. My first adjustment was not only the start to “pain-free living”, but it was also the day I decided that I wanted to help others who were hurting just like me. This was the day that I found my calling as a chiropractor. 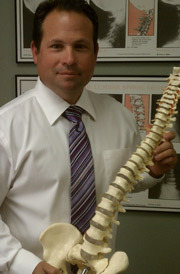 Dr. LaBruzza began his pre-chiropractic education at Fairleigh Dickinson University in New Jersey. After receiving a Bachelor of Science degree at FDU, he continued his education at Palmer College of Chiropractic in Iowa and graduated with a Doctor of Chiropractic degree. He then returned to New Jersey to establish his practice, as well as to continue his post-graduate education. Dr. LaBruzza furthered his studies for an additional three years at New York Chiropractic College, in Chiropractic Orthopedics. As you can see, I have greatly benefited from visiting a chiropractor and I truly believe that you can too. Give our Glen Ridge chiropractic office a call today to arrange your first step toward relief and better overall health!